Choosing a video production company is work. It requires time and effort. In this blog post we will try to give you some tips on what to look for when analysing offers of various video production companies. It is especially hard to make this choice as video production is not a product. It is a service and as such it can be done in so many different ways – every company can offer very different production options that can make comparison very difficult. 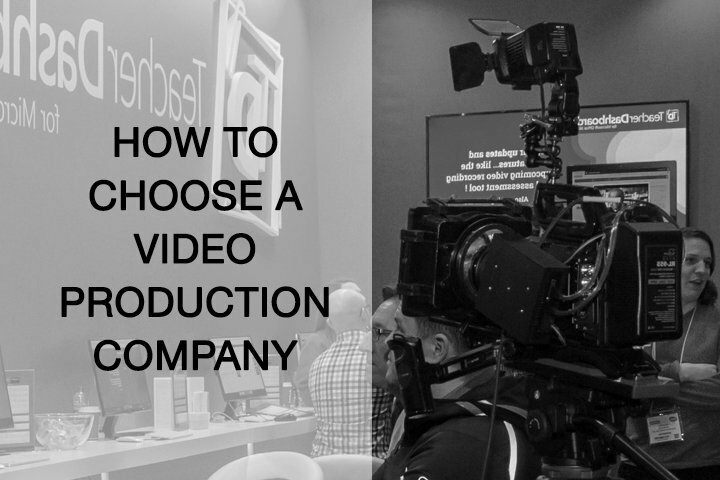 Here we are offering some tips on how to narrow down your video production company list and how to eventually choose the right one. Let the work speak. Spend time watching the videos of your prospective video production company and you will get a general idea of what this company can deliver for you. There are several aspects to think about. Aesthetics is one such aspect – video production is a creative work and what looks great for one, will not be suitable for another client. Also the range of work produced previously is important – you cannot expect a feature film output from a local company that has mainly produced talking head style promos. Don’t be shy and ask the company to provide you more examples of specific types of videos. Often video production companies have so much work in hands that a lot of the newest videos have not even been uploaded in their online portfolios. For some people, their choice of video production company is mainly determined by who has the most exposure or experience. On the other hand, others prefer companies that can be best described as neophytes in the video production business. They prefer these companies mainly because they think that such companies will allow for more novel content. Younger companies will also in most cases offer better prices. Regardless of the credibility of these notions or practices, the fact remains that there is a variation in every situation. And though the choice of which video production company to go with is basically reduced to either “vast experiential knowledge” or “a fresh look on things,” the producer or marketing manager can always get a company with a blend of both. One just needs to do some research. Like in any human relationship, chemistry is an important element also when working on a video production project. This implies that, if you don’t feel that the working relationship between your team and a video production company is great, it makes no sense that you continue to work with the company for three or six months. To put it simply, if there is no synergy or harmony between the culture of the video company and your own culture, then it’s unlikely that you would get any good result. Videos should be tailor-made so as to meet the requirements and vision of your company or organisation. Any reputable video production company will reach out to you with many requests of information and details in order to make sure they deliver content that fits your requirements. In the event that you feel like they don’t ask your opinion, or that you are not given attention, you should look for another video production company. Such that assures you at every step of the way that your needs will be met. You need to ask yourself: Does the video producer expresses my message in a persuasive way that is also simple to grasp? Do they manage time to reach out to me and to understand what my company and product is all about? Most times, it is easy for you to tell the video production company’s level of engagement when they’re working with you by one easy test – do they actively want to know about how you want your video to be. While some video companies will be glad to make use of what information you yourself give them, other companies will go the extra mile and ask for more and more information to really understand what you need. That said, your preference will largely depend on what you find more appealing. The concept of “scope of work” of any video production project is a critical consideration. This means that it is very crucial for you to talk to the production company about the extent of the service that you want from them. Just like in many fields that require creativity, sometimes the client has vague expectations and sometimes the service provider is vague about what they will offer. This in most situations lead to misunderstandings and disappointments in the end. As much as possible, there needs to be a perfect understanding between you and your video producer regarding what exactly will be done. Talk with them about all stages of production – pre-production, production and post production – and what will be done in each of these stages. Manage enough time to talk about your vision and what you expect from the video in a way that your message is clearly understood and expressed. Video production comprises a wide range of services that go beyond just shooting a video. These include editing, script writing, animation, colour correction and so on. Thus, you always need to ask whether the company you are considering offers an all-inclusive service, or if they leave some aspects unmentioned. Educate yourself a bit about all stages of video production so that you know the basics of what it entails and can make an informed negotiation. After finding out all you need to know about the services offered by the company and how good their work is, you should ask yourself whether you are good with their pricing. Ask yourself how open and transparent are they about their pricing system. Ask breakdowns of price. Ask whether they offer any video production cost calculation tools. Video production is such service where many things can be negotiated and you should. And remember – some services are too cheap to be good. And on the other hand – an upmarket company with big reputation will charge a premium (sometimes it is worth it, other times – not so much). Finally, you need to ask yourself whether you would want the company to produce for you again in the future, or not. Often times, it is not required that you sign a contract with the video production company to continue working with them. However, if you’re satisfied with their services, it’s best to make your relationship with the company more than a one-off affair and continue to use them in the future. Due to the fact that the company would already have your media assets, it becomes easier to produce content for you in the future as they will be accustomed to your needs. Also, since the company will get more familiar with your work ethic, the production process would be faster and without much trouble. In addition to that there will be coherence in all your videos if all of them are produced by the same company, which is vital to the success of your video marketing endeavours. While it may seem to be a daunting task in the beginning, the journey to understand how to go about video production gets easier as you begin with your first video. But rest assured that your investment – both in terms of time and other resources – will definitely help both you and your company or organisation to prosper.